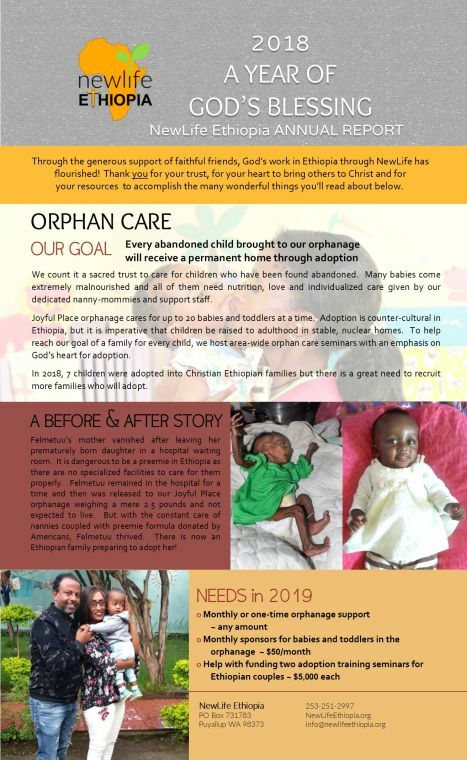 In 2007 our adventure in Ethiopia was launched with a diligent effort to improve the living conditions of 23 orphans living in an extremely poor orphanage in the town of Nazaret. That experience prepared us for the next step of opening a care center that uniquely addressed the needs of the fatherless and the elderly. 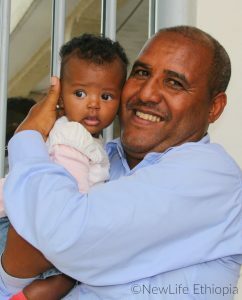 While international adoption was allowed in Ethiopia, NLE placed 138 children into forever families in the U.S..
Today, working hand-in-hand with Ethiopian and American churches, we tenderly care for abandoned children brought to us by the government until they can be legally adopted into a strong Ethiopian Christian family. 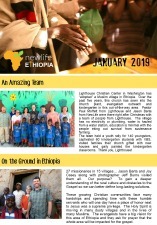 In addition to orphan care/in-country adoption, NewLife Ethiopia works in some of the most difficult areas of Ethiopia sharing the liberating Good News of Jesus Christ to unreached people. NLE encourages indigenous churches, provides training for leaders and new converts, and brings kindergarten education to village children. We strive to be honest and consistent in words and actions. 2 Corinthians 8:21 ~ For we are taking pains to do what is right, not only in the eyes of the Lord but also in the eyes of man. We believe each person is made in God’s image which directs our outreach to abandoned children and to unreached people in the communities in which we serve. Psalm 82:3-4 ~ Defend the weak and the fatherless; uphold the cause of the poor and the oppressed. Rescue the weak and the needy; deliver them from the hand of the wicked. We believe that God intends children to belong in families. This is God’s plan for those He created so that Godly values are passed from generation to generation. Deuteronomy 6:6-7 ~ You must commit yourselves wholeheartedly to these commands that I am giving you today. Repeat them again and again to your children. Talk about them when you are at home and when you are on the road, when you are going to bed and when you are getting up. We are responsible with the resources our donors give us, recognizing they are God’s gift and provision and not our own. We are called to take the Good News into all the world in Christ’s authority. Matthew 28:16-20 ~ Go therefore and make disciples of all nations, baptizing them in the name of the Father and of the Son and of the Holy Spirit, teaching them to observe all that I have commanded you.